The Arunachal University of Studies has conferred upon the Honoris Causa Doctor of Literature Award to Union Minister of state for Home Affairs, Government of India, Kiren Rijiju. The award was bestowed to him by the Pro-Chancellor of University Vishva Lochan and Vice-Chancellor Prof. V.K. Kawatra. Rijiju while expressing his happiness over the development of the several higher learning educational institution and AUS as one of them. 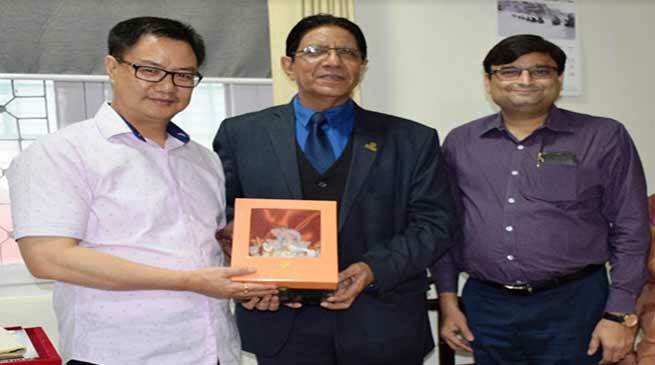 He lauded the authority of the Arunachal University of Studies for imparting quality higher education to the upcoming generation of the state which will become the foundation in transforming economic conditions of North East and Arunachal Pradesh making it more prosperous in coming years. He further said that the University is gradually becoming one of the largest & most progressive Institution of the region under self-sponsored category in the field of higher education. He also mentioned that if such establishments were made in 1970’s then the present education scenario in the region could have much better been altogether different. He expressed his satisfaction and said that the University is duly recognised from statutory bodies and is developing a world class infrastructure. It is noteworthy to mention that Arunachal University of Studies is the only UGC recognised University of Eastern Arunachal Pradesh and has created laurels in the field of education with its excellent education methodology, infrastructure and is continuously promoting the cause of quality education with the help of its 12 constituent faculties. The Arunachal University of Studies is abridging the education gap in the region which has been felt from quite sometime time and is creating more appropriate linking between the school education and higher education. It is like dream coming true and He said he feel happy to have become a part of growing institution and assured of wholeheartedly cooperation for the development of the University and appeal all stake holders to come together in developing the education sector and education scenario in building of human resource development of the state. AUS Director Trilochan Singh inform that that announcement of the degree was already done on 2nd Convocation of the university on January 31 2018 and since he was absent and the degree was handed over to him at his office at New Delhi recently.